Size: 14.6 x 20.1 inches. Title: 'De Werelt Caart'. Publishedin a Dutch Bible with Biblical text on verso. A beautifully engraved double hemisphere map derived from up-to-date sources of information (probably French). The tributaries of the Mississippi are depicted, California is an island, Australia is nearly complete, except for the east and southern coast, and there is just a part of Van Diemen's Land. Part of New Zealand is show, as well as Quiri Regio. 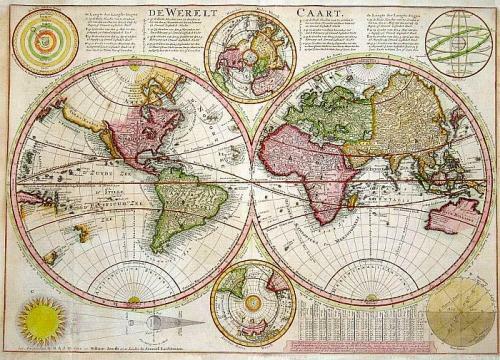 In the four corners of the map are astronomical diagrams with explanations in Dutch text, and at the center are north and south polar projections.